Rethinking Bhopal: A Definitive Guide to Investigating, Preventing, and Learning from Industrial Disasters is the go-to source for anyone seeking to learn how to improve process safety management (PSM) through applying fundamental asset reliability and incident investigation concepts. The seeds that unified PSM on a global scale were planted in Bhopal, India on December 3, 1984. Since then, considerable progress has been made to protect both workers and communities from catastrophic industrial failures. Industry acknowledges its responsibility to create value with accrued operating experience and that using information received from previous failures is a direct way to prevent future incidents. With this principle in mind, Bloch evaluates modern references related to the Bhopal Disaster, using recognized industrial asset reliability and incident investigation concepts. The practice of objective incident investigation offers a compelling insight into specific decisions and actions that resulted in history’s worst industrial disaster. Recording a fully transparent sequence of events promotes a personal sense of accountability for anyone involved in the manufacturing industry. Lessons learned can be immediately implemented by those with direct PSM, management, engineering, and operating responsibilities. Case histories demonstrate how patterns observed in the timeline leading up to the Bhopal Disaster can be detected in modern incidents and by recognizing these patterns in present-day processes avoids counterproductive operating decisions and unprecedented destruction. This text is instrumental in helping existing organizations re-evaluate their own exposures and risks, and would be a valuable read for any member of a process safety management team. 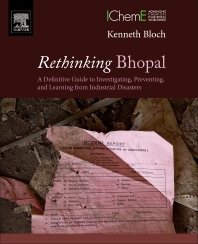 Rethinking Bhopal: A Definitive Guide to Investigating, Preventing, and Learning from Industrial Disasters provides an expansion of knowledge and understanding for the novice in PSM while also providing depth and application considerations to challenge more experienced industry professionals. Note: All royalties from this book go to the Process Safety Heritage Trust Scholarship at Lamar University in Beaumont, Texas, USA.